Backpack bomber Kevin Harpham was sentenced to 32 years in prison Tuesday, despite insistence of his innocence and an attempt to withdraw his guilty pleas. Judge Justin Quackenbush says he opted for the maximum sentence because Harpham denied responsibility for the attempted bombing of the Martin Luther King Jr. Unity Parade last January. Harpham, wearing a white prison jumpsuit and sounding tired, spoke to the judge in a courtroom packed with reporters and federal law enforcement agents who stayed through the nearly three-hour hearing. The Stevens County man told the judge that he was innocent, and only took a plea agreement last September because he believed new evidence would be presented that could acquit him. He added that a homemade bomb he constructed was intended to blow out the windows of the local optometry business across the street, not harm the marchers. It was a statement of protest, he says, against unity and multiculturalism. He also told Quackenbush that he had originally intended to use the device for another purpose, but decided not to. He did not elaborate on this other purpose. At a news conference after the sentencing, U.S. Attorney Michael Ormsby said there is no evidence that Harpham had any collaborators or plans for another bombing. At the start of the hearing, Harpham’s federal public defender, Roger Peven, tried unsuccessfully to get the pleas withdrawn after claiming that he had a report from an explosives expert that would cast doubt on the functionality of Harpham’s bomb. Quackenbush denied the motion, and in sentencing Harpham, the judge excoriated him for his white supremacist views. In last week’s cover story (The Road Forward), we ended the piece with Tim Connor, a longtime police accountability advocate, and his skepticism that any reforms would be made at the police department. We also mentioned he was part of incoming Mayor David Condon’s public safety transition team, which includes former Spokane Police Chief Roger Bragdon, former U.S. Attorney Jim McDevitt, Fire Chief Bobby Williams and a former president of the Police Guild. Condon says he’s sorry to see Connor go, but that he made it clear from the beginning these weren’t public meetings. “I’m obviously committed to the openness about anything that comes out of these meetings,” Condon says. 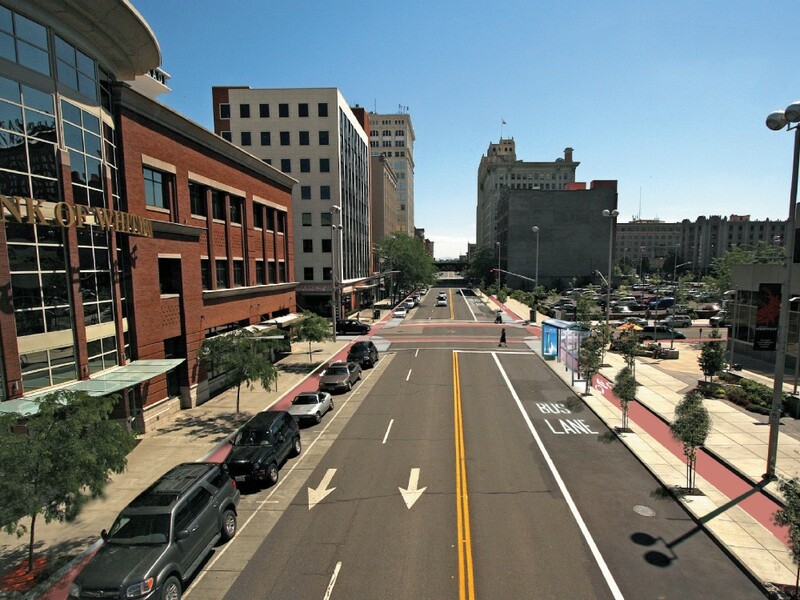 It may soon be safe to walk and bike around town after the Spokane City Council voted 5-2 this week in favor of a “Complete Streets” ordinance. This ordinance will require that during street reconstruction, pedestrian and bike infrastructure must also be a part of the construction. There is a catch, though, as the infrastructure would not have to be included in the construction if its cost is equal to 20 percent or more of the total project cost. Council members cited several reasons both for and against the ordinance including that completing the streets would take money away from improving crumbling pavement. Councilman Jon Snyder, who ran on a Complete Streets platform in his bid to join the Spokane City Council in 2009, says that this ordinance will bring about many positives for the city. “By making it easier for folks to bike, walk, and ride the bus the city can avoid congestion, save on pavement maintenance, and grow our tax base by creating a better environment for local business,” he says. About 40 citizens also gave their two cents about the ordinance at the meeting, which ran until 1:30 in the morning. Many had heard about the council’s discussion of the ordinance through Futurewise, a land-use group that delivered a petition with 500 signatures in support of the ordinance. Kitty Klitzke, who heads up Futurewise, says most streets won’t need to add bike lanes, bus lanes or other elements that “complete” streets. And if they do, the improvements add a nominal cost.